You'll be able to edit and share screenshots straight from the app. Google app is extremely close to rolling out a built-in screenshot-editing tool -- so close that you can now try it out as a beta tester on Android. If you join the app's beta program and download version 7.21, you'll find an option that says "Edit and share screenshots" under settings and then under Accounts & Privacy. Toggle that on, and you'll see a panel pop up from the bottom of the page whenever you take screenshots anywhere you are within the Google app. 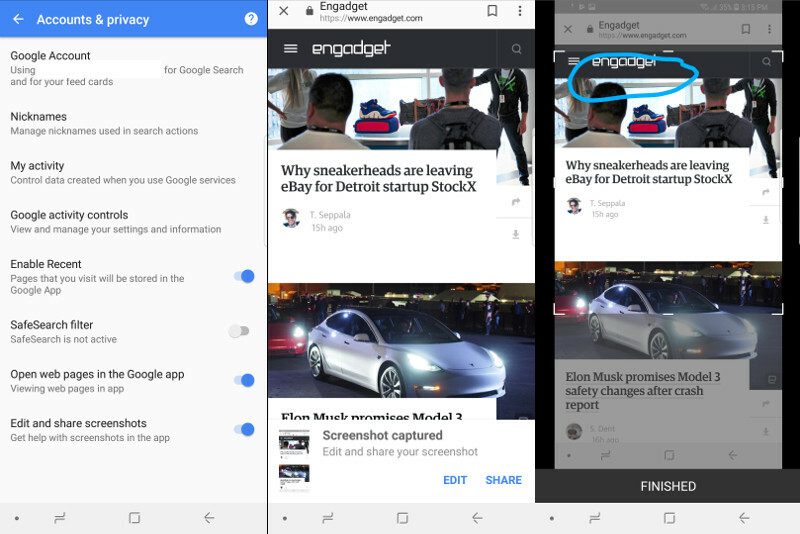 The panel will give you the choice to edit the screenshot or to share it to other apps straight from within the Google application or from within a Chrome Custom Tab. If you choose edit, you'll be able to crop the screenshot, draw on it and then share it once you're done. It's not big deal if your phone uses an Android skin that already has the feature, but if you're using stock Android, it could make the process of taking and sharing screenshots just a bit faster.